Dear Karin, We are happy that you received the resort’s confirmation shortly after you posted your review and that you have received same. All reservation details can be accessed under the “My Reservation” tab, which is located at the top of our website. Please feel free to call 888.845.0602 if you have any questions or would like further information concerning your reservation. Thank you for choosing BookVIP. Over the phone, two representatives said that my husband (42) & myself (28) will be ok to do the promotion. The terms says 30+ for married couples. We make over the annual amount, but don’t want to be charged then canceled later. Dear Salae, I am pleased that we were able to speak with you and resolve your concerns. We work very hard to ensure that each and every customer is aware of how valuable they are to BookVIP. I tried to sign up for the 7-day free trial a couple of weeks ago, but their system wouldn't process my card. It said there was an issue and it wouldn't let me sign up for anything. I have no account or login information to check prices or anything like that. Now there is a charge on my account for the monthly fee of $59.00 and I have never even used the site! I need a refund and for them to cancel my membership so i am not charged again for something that I've never even used! How do i go about doing this? Dear Ashley, Thank you for your feedback. We apologize for the login issue you experienced during a system update. We appreciate you bringing to our attention so we were able to immediately resolve the issue to your satisfaction. We work very hard to ensure that each and every customer is aware of how valuable they are to BookVIP. The reason we have over 3.8 Million Facebook Likes, more customer video reviews and have sent over 100,000 people on vacation this year alone, is because we are the worldwide leader in promotional packages - that's our specialty. If you meet the resort's requirements and agree to attend the resort preview, you will receive the promotional rate. If I have traveled w book vip in the past, can I book additional trips through your site with the discounts to different destinations. What is included in your advertised pricing? Are resort fees included? Are taxes included? Are any duties or other resort charges not included in the price? I like the pricing I'm seeing, but unfortunately I've been screwed by "free" nights before where suddenly with Taxes and Resort Fees it was getting pretty pricey for a "Free Stay." I can't find where this information I'm asking for, especially resort fees, is disclosed before I"m asked to provide a credit card and make the reservation. I want to know what my costs will be before paying anyone anything. Can't sign a blank check or open-ended contract. That being said, I look forward to your reply because at least two of our packages would cover planned vacations. Resorts fees and taxes are separate from the booking price. Those fees and taxes are dependent on the days that you stay and the amenities you are provided. You would have to pay those fees regardless of who you booked your stay with. Hope this answer helps! Do I have to b part of a time share in order to book a vacation package though u guys??? Hi Angela,The resort just asks for 90 minutes of your time, one time during your stay to show you the benefits of the resort's frequent travel program. There is no obligation to buy anything and you will save up to 80% on your vacation. 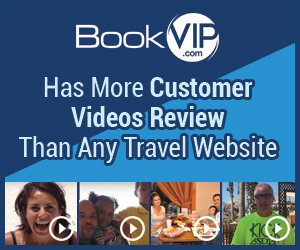 BookVIP has over 26,000+ customer video reviews more than any other travel site! The presentation is really about 3 hours long but they usually provide you with breakfast or drinks. Of course, they want you to buy a timeshare at their hotel but hey do that when you can travel with BookVIP anywhere in the world for up to 77% off?! If I have an urgent issue how do I contact BookVIP about my reservation? Our Premium Trip Guard Insurance is offered for every purchase. This insurance will allow you to cancel and receive a full refund with no questions asked. However, most decline our insurance because of our flexible rescheduling policies. You only need to meet the resort's requirements and agree to attend the resort preview to receive the discounted rate. All the Terms & Conditions of the offer are listed at the bottom of each web page as they are slightly different for each. Where are the terms nd conditions located on this website so I can review them please? Why are the packages so inexpensive? BookVIP is the largest provider of promotional packages in the world. You can save up to save 70% of the retail rate on the promotional packages because the resorts are subsidizing the cost of the vacation in exchange for meeting the eligibility requirements and attending the resort preview. Can multiple reservations be booked at one time? Our packages may not be used in conjunction with any other promotional offer from our agency, any other company advertising another resort or for use with another vacation ownership week on the same, similar or adjoining arrival and departure dates. This applies to qualified guests, family, and friends traveling at the same time.